If you want to create PDF output of a bunch of logs, you can automate this using the Log | Batch Compile menu command. Here are the steps I've taken to set this up. NOTE that this requires that you have a PDF program, such as Adobe Acrobat Pro, or any of the free PDF printers (PDF995, CutePDF, etc. - see other forum postings regarding these) installed as a printer in your Windows system. 1. First, be sure you're using a build of LogPlot7 that is 7.4.81.107 or newer. 4. 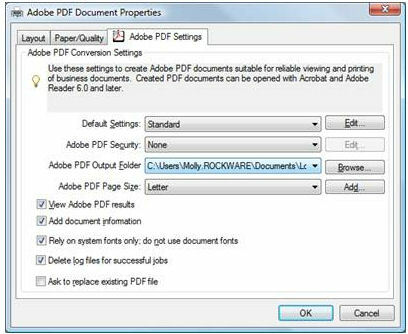 Set up the PDF printer to NOT prompt for PDF file names, and set the output folder to the same folder where the data files reside. I've attached an example of what my Acrobat Professional screen looks like, though your version or your PDF printing software may be different. Note that this is an important step so that you won't be prompted for each PDF output file name. 5. Then, select the Log | Batch Compile menu option in LogPlot. 7. Click OK when you're done, and you'll see this log's items listed in the batch window. 9. Save your batch at some point, using the Save button in the Batch Compile window. At a later date, you can use the Load button in this window to load an already-saved batch listing.
! Note: the BTC file that is created is an ASCII XML-type file. If it is easier for you to modify the BTC file directly to add other logs, you certainly may do so, just be careful about the XML syntax. 10. To run the batch, just click the Go button at the bottom of the Batch Compile window. 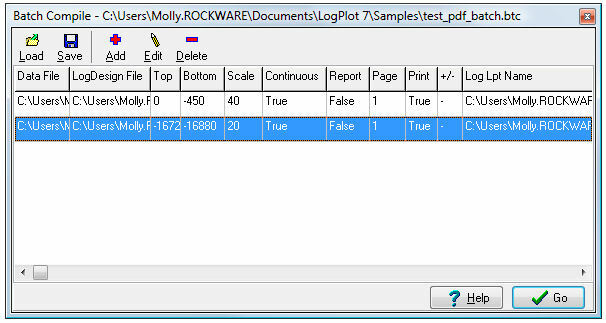 Logplot should load the selected DAT file, compile it into the selected LDFX file using the indicated settings, save the requested LPT file, and print to PDF, storing the PDF file in the requested folder. Note that Adobe Acrobat contains functionality to combine separate PDFs into a single file. 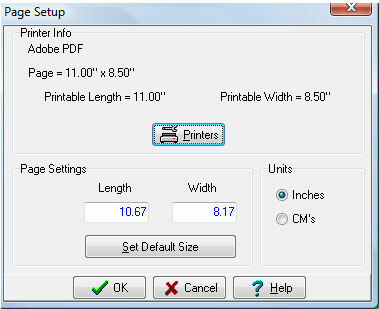 This is in the File | Create PDF | Merge Files into Single PDF menu on my version. If you don't have Acrobat (the full version, not just the reader) you can do a web search for free utilities which do this.